Sorry about the delay on this one.. I had everything written and then we had computer problems. It took a while to resolve them so that I could rescue the photos I took of these for the post. You know how I said we overbought carrots a few weeks ago? We kinda did the same thing again… but with cabbage. We eat a lot of cabbage (one, it’s tasty, two, it fills you up cheaply, both calorie-wise and cost-wise, and three, I have difficulty eating lettuce) and since Rancho has good, fresh cabbage all the time for a good price, we bought a couple of heads. Twice. So, we needed something that would use up some cabbage and wasn’t a salad. Now, for some reason, cabbage doesn’t get a lot of love from American cookbooks. Oh, sure, it’s in there, but often as a garnish or on tacos if it’s not just relegated to coleslaw. 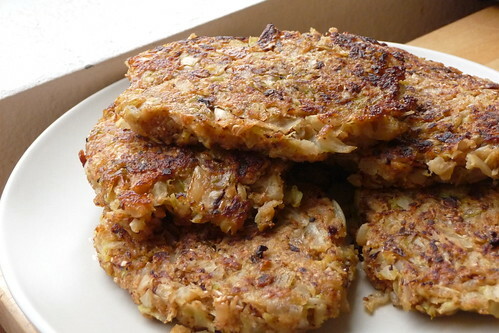 We found what we were looking for in the updated English version of Latviešu ēdieni, Latvian National Cuisine: Cabbage patties. Except I had to rename them. When we had them the first time, they tasted just like fantastic latkes but a little sweeter. And they’re definitely not as calorically dense as real potato latkes; the entire recipe, if you were to sit down and eat the whole batch, would cost you under 400 calories. Grate the cabbage and onion on a box grater or mandoline into fine shreds. Keep the two separate. If you have a food processor, fit it with the grating disc and grate each separately. Using a potato masher or stomper, press the cabbage until it becomes juicy. In a deep skillet over moderate-low heat, saute cabbage. Stir often — without fat, it will be easy for it to burn — until the juice evaporates. Stir in the farina and heat for 15 – 20 minutes, or until the mixture pulls away from the pot. Let cool. Using a tablespoon of butter, saute the onion and garlic with a pinch of salt until browned. Remove from heat and stir into cabbage mixture. OR… You can saute the cabbage, onion and garlic together at once with a tablespoon of butter or oil and a pinch of salt. It’s a bit easier and makes less work. Let cool briefly, then add the beaten egg, mixing well. Shape the mixture into small patties and saute in remaining tablespoon of oil, flipping once, until golden brown and delicious. 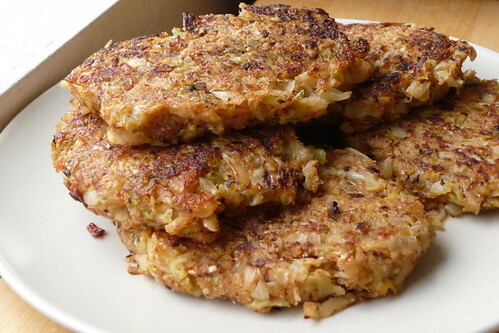 These are great just as they are, but you can also dredge the little patties in bread crumbs and fry them up that way. Farina is best known as Cream of Wheat in the US. Latvians know it as manna. This entry was posted in latvian, recipes, side, untranslated, vegetable, vegetarian. Bookmark the permalink. Fascinating recipe Cori, must give it a go. I guess you can keep these warm in an oven until they’re all ready? Here we call Farina semolina and I didn’t realise this is manna which I had not heard about since childhood. Dad used to make a wonderful concoction called debesu manna with blueberries we grew in the garden. Great memory. Absolutely – or you can keep them on the warm skillet under a lid, which is what we often wind up doing with similar things. When I tried to translate manna, semolina is what came up first. However, what we have here in America is just not the same texture — our semolina is more like cornmeal. Farina seems to be in between here in the States but at least the texture and size is close enough.